For Beth Blanton, it’s all about the little things. A morning hug. A new word or letter learned. A child raising his hand in class for the first time. Beth is a volunteer for Foster Grandparents (FGP), a program of United Way of Northwest Vermont through which adults age 55 and older earn a small stipend and remain active and engaged in the community through volunteerism with children at local schools. 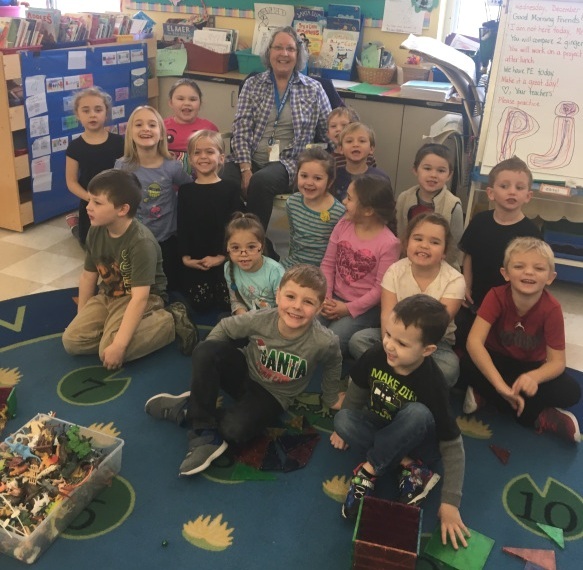 Monday through Thursday of each week, Beth spends the better part of her day with the kindergarten class at Bellows Free Academy in Fairfax, Vermont. Beth first learned about the FGP program through her friends and fellow FGP volunteers from church, Joyce and Maurice. A retired accountant and breast cancer survivor who moved to Fairfax, Vermont five years ago to be closer to her daughter and grandchildren, Beth was looking for an opportunity to work with children. Her friends spoke so highly of the program, she decided to fill out an application with hopes that she could bring happiness to local youngsters and also do something positive for herself after undergoing radiation treatment. With a bright and cheerful attitude, “Miss Beth” began her placement in the 16-student kindergarten classroom at Bellows Free Academy in her town of Fairfax in December of 2018. Beth is the first and so far, only, FGP volunteer to serve at the K-12 school. Little did she know, Beth was entering the classroom at just the right moment. She soon learned that the kindergarten teacher, Mrs. Aceto, was also facing a breast cancer diagnosis. When Beth started working in the classroom, she was able to have an immediate and positive impact on the students and their routines. “I like to get there before the kids arrive. I like to greet them – they always have a smile or a hug. The kids have so much love to show,” said Beth. Beth describes her role in the classroom as one of support – being there for the kids, providing emotional support, reading to them, helping them, and gently reminding them of their manners. When a child is being disruptive or becomes agitated in class, Beth spends one on one time with them, either sitting together in a corner away from the other students or taking them for a walk down the hallway. This way, the teacher can continue with the lesson without the entire class being disrupted. Beth’s biggest accomplishment, she said, is helping the kids learn to be in a group. It brings her great joy and satisfaction knowing she is helping the children learn and grow in small ways. For example, one little boy would not speak up among his peers. After working with him one on one and encouraging him to raise his hand when he knows an answer, he recently raised his hand in class for the first time. Now he’s asking questions, sharing and building his confidence in a group setting. “I’m grateful for finding FGP. It’s given me so many blessings,” she said. For more information about United Way of Northwest Vermont’s Foster Grandparent Program and how you can get involved, please click here.